EWB-USA Rutgers Guatemala Team updates friends, family and fans about the progress of the project with our Central American neighbors in the community of Chi Elias in Totonicapan, Guatemala. 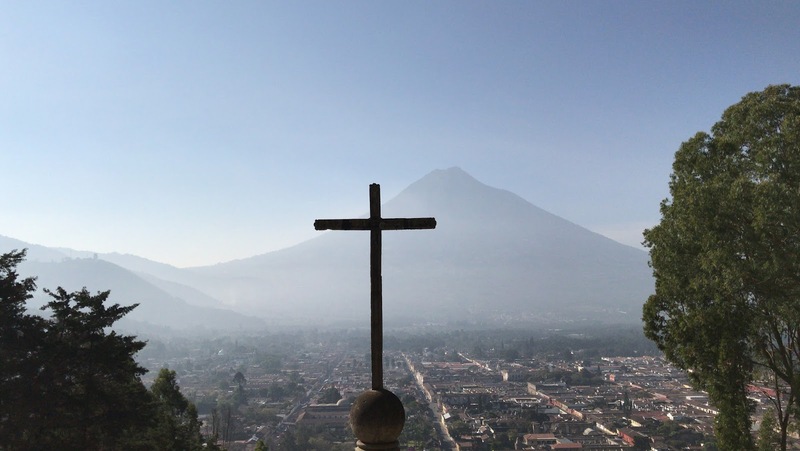 Chi Elias Assessment Trip: Antigua & Adiós Guatemala! Our trip is finally over! Early this morning our team landed back in the United States, but not before a fun day in Antigua, Guatemala! On Tuesday, we started with a hike up the Pacaya Volcano. We saw lava, more volcanoes, volcanic ash, and roasted marshmallows over a hot spot in the volcano! After that we walked around Antigua and visited their many artisan marketplaces, some beautiful churches, huge plaza, iconic arch, and delicious food. 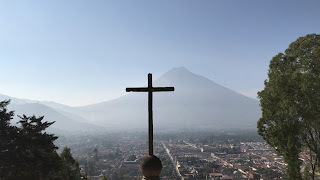 Before leaving on Wednesday we took a quick hike up Cerro de la Cruz and checked out the huge cross and the extensive view of Antigua and its volcanoes. 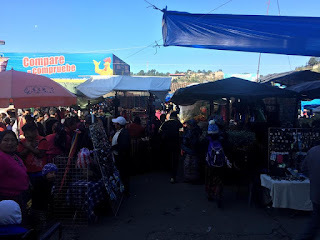 +After the climb, we checked out some more markets and headed back to Guatemala City. There, we met Carlos' family again and had more Pollo Campero. We then had to get back to the airport so we could catch a plane to Panama City and then another one back to New York City. We spent most of today recuperating, sleeping, and preparing to return to classes on Tuesday. This trip was such a great learning experience for the whole project. We got lots of good information about the Chi Elias school, their community, culture, and how to proceed with the project. I can't wait to get back to planning our next steps and getting the school built! Hopefully, after many meetings and a lot of hard work, we finally get 2 new classrooms, an office, an event space, and a fence for the students at Chi Elias. With Engineers Without Borders, we can improve their future. Lastly, I'd like to thank our wonderful team: Angela, Stefan, Carlos, and Brad, who all dedicated so much time and energy into a cause we all believe in. I'd also like to say a special thank you to Allison, out other project lead, who unfortunately could not join us on the trip. She, along with the rest of our project back at Rutgers, has worked so hard to make this trip a reality for us. I'd also like to thank you for keeping updated on our trip and for supporting our project! Look out for our next trip! In the meantime, check out what we're up to at the links below! Today was a very emotional day as we said adiós to the kids at Chi Elias. First, Jeanny and the mayor of Momostenango arrived and we had a brief meeting together with parents of students at Chi Elias to evaluate the municipality's role in the project. We also presented the teachers with a board we made to be hung up somewhere around the school to remind them of our Engineers Without Borders and also to post updates on the project. As today was their first day back after a long break, the kids were mostly playing around the school, so we took the opportunity to get to know them better. We learned they really like basketball, games, and pictures! An intense game of basketball. These girls followed me around all afternoon asking for "¡Una foto!" Eventually we did have to say goodbye to hopefully return sometime soon with next steps their new school. After that, we left for Antigua and are now staying in a hostel for the rest of the trip. We have a lot planned for tomorrow so until then, ¡buenas noches! 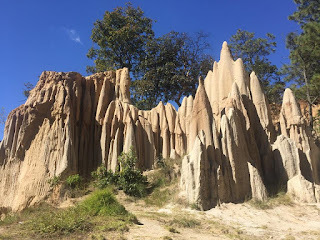 Since it is a weekend, nobody was at Chi Elias so we took some time to explore Momostenango. 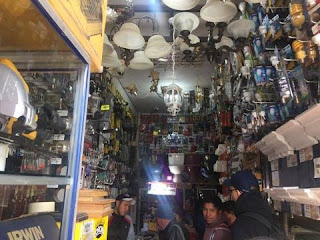 On Saturday, we set out to find good local hardware stores and their prices so we could more accurately analyze the cost of this project. Inside a hardware store in Momostenango, Guatemala. They really packed everything in there! To ensure we weren't being overpriced for being tourists, we brought a team of some members of the Chi Elias community to show us around. We were only expecting a tour around some hardware stores, they ended up showing us all around Momostenango! We explored a natural canyon, struggling to keep up with some of the older locals. it wasn't until after we climbed all up and down each crevice that we found out it was a Mayan ruin! This is great! But how do we get down? We all then went out to lunch at a local eatery that had cow tongue on the menu. I opted for chicken soup and rice but Stefan and Carlos were brave and decided to try it! We also were taken to a natural water park with pools, waterfalls, and hot springs. The water was beautiful and clear with some local kids enjoying their weekend splashing around. There was also a station for people to wash their clothes with clean water flowing over wash boards. It was a beautiful example of good engineering in a place that greatly benefits from it. We then had dinner around town, first having pupusas, or fried tortillas stuffed with cheese and topped with cabbage and salsa. They were delicious, with so much love put into every pupusa as it was made before our eyes. We then decided to stop by a store with a taco truck in it. They had tacos and tortas so big and delicious that we returned for lunch and dinner today too! Although Stefan got us lost on the way there so now he has been reduced to our Solar-Powered Navigator in that he only knows his way during the day. Tacos from the place across the street from the barber shop. 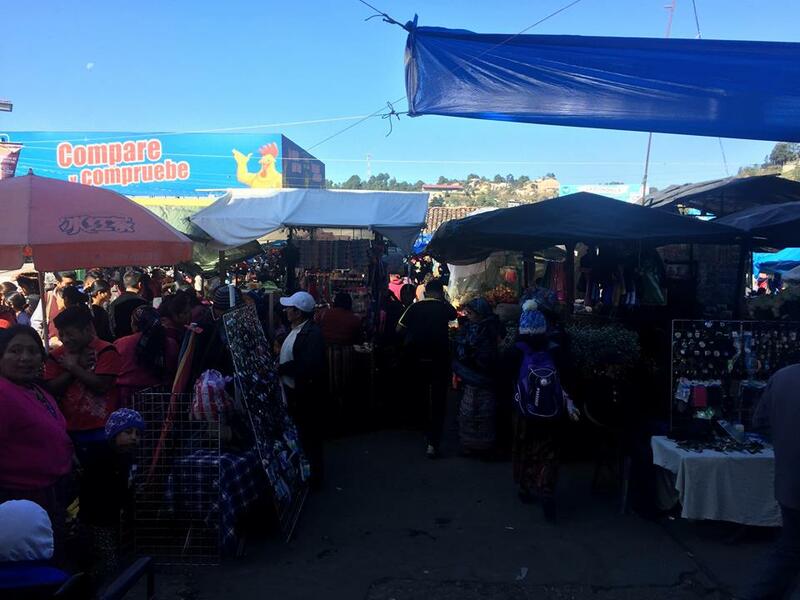 Today was Sunday, or Market Day across Guatemala. This meant the sidewalks turned into stores and the streets flooded with people. We made the mistake of trying to run a quick errand and nearly drowned in the crowd. It was a thrill to see all that Momostenango had to offer from grains and meats to bags and shoes to chickens and cows all displayed in the center of town. I tried to stop for a moment to capture Market Day before getting swept away in the crowd. 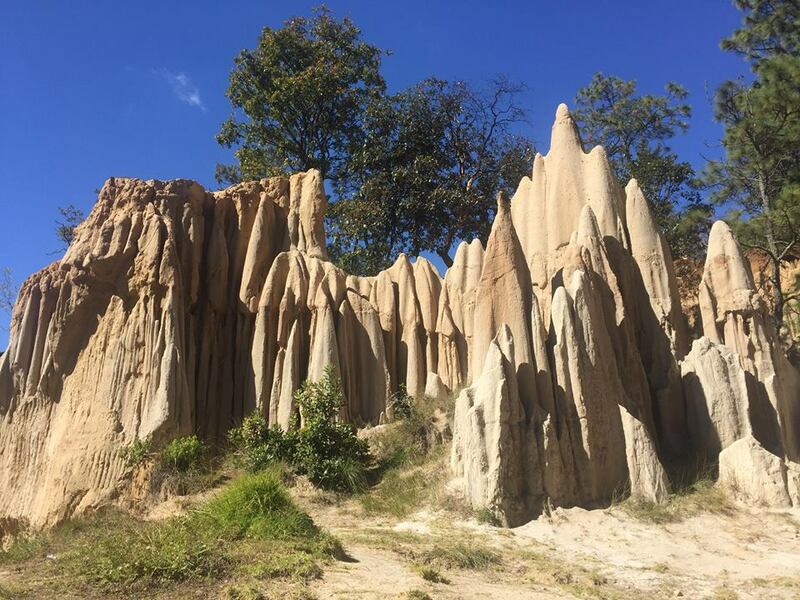 We returned to the hotel to discuss what we've learned about Chi Elias so far and how to proceed with the next couple of days, weeks, and months with the project. We finished the day with more tacos and the Golden Globes, getting a much needed taste of American entertainment. We have a long day ahead of us tomorrow! So until then, ¡buenas noches! Today in Guatemala, we took some more measurements of Chi Elias and met with some parents from the school. Napoleon told us that unfortunately, due to other events happening in the community, only about 10 parents would be able to make our Q&A session. However when parents started to arrive, we had to move the meeting from inside to outside due to how many people showed up! Some of the parents and students of Chi Elias. In total, about 50 people came to our Q&A session. Our engineers from the EWB Guatemala office, Jeanny and Waleska, also came by. We discussed who Engineers Without Borders is, how the project will happen, and what to expect from us throughout the project. We mentioned how we will only come by every so often, but just because they don't see us doesn't mean we've forgotten about them. We will still be working on their school every week at Rutgers. We also explained to them how we will expect from them a 5% contribution to the project in the form of materials. This includes any wood, concrete, or other tools we may need. Although this was initially a concern for the community, we encouraged them to leave the worrying to us for now as we are there to help them. The teachers then invited us for a lunch of a traditional Guatemalan soup, tea, and of course more oranges. The soup had beef, vegetables, and noodles and the tea was made with corn, barley, and cinnamon. Both were absolutely delicious. Napoleon told us, "Although we do not have much, God is big" as Carlos loosely translated to us. Brief appreciation for the whole team: Carlos has been an amazing interpreter, Angela a wonderful leader every step of the way, Stefan a brilliant navigator, and Brad an endless source of wisdom. Our success on this project is thanks to the work of everyone on the team. After lunch, we had a meeting with the teachers to discuss some technical options for the project. This included details such as how to level the land, where the office would go, and how to optimize usage of the event space. Fortunately, the teachers did agree with most of our ideas with constructive feedback on some. We had a productive, supportive, cooperative meeting with the community of Chi Elias which is more than we could ever hope for in this project. With the support from the community, as we have been so careful to generate, will allow us to fully improve the community with the best of our abilities. We have a busy weekend ahead of us, so ¡buenas noches! Today we finally got the opportunity to see the Chi Elias school! We woke up early this morning, had breakfast at our hotel, and discovered an awesome balcony that overlooks Momostenango. They currently have 6 classrooms, one for every grade. Two of the classrooms were poorly built and the moisture in the rooms is giving children respiratory and gastrointestinal problems. Currently the principal holds important meetings in the first grade classroom. This is where she teaches and it is also the nicest and safest room in the school. The government started a project in the past to put a fence around the school. However, they only finished less than half of it. A fence would protect the students from wild animals and also dangerous terrain. The school hosts many important community events, including Mothers' Day and Kids' Day celebrations. They would like a large venue to host these events. We have quite a few tasks on our plate! However with the community's enthusiasm and their willingness to put some hard labor into the project, it definitely seems possible within the next few years. The teachers have such a dedication to their students that shows in the students' achievements. Napoleon told us that usually out of a Chi Elias graduating class 25 students, 8 will go on to secondary school for 7th, 8th, and 9th grade, compared to the local average of 1, if not 0, continuing with their education. The school does not have much, but they do so much with what they do have. Napoleon packs classes in reading, math, natural sciences, social sciences, debate, physical education, English, and so much more into every week! The students are so smart, however, due to financial issues, very few have the opportunity to apply this knowledge. We're so excited to enhance their education and hopefully make this easier for students to succeed later in life. Observing the back of Chi Elias. There's a steep drop and no fence! After we got some background on the school, we toured the buildings and surveyed the land. Some of the classrooms were very well built, however some were somewhat improvised. It seems that in addition to adding new buildings, we may have to do some repair to the old ones. Chi Elias doesn't have much land, so adding four new buildings might be tight, but we're thinking of creative solutions to present to the community leaders tomorrow. 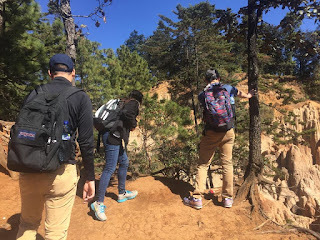 The land, being in the mountains, is also very sloped and rocky. We will thus also have to be creative with how we level the land before building. There's some good engineering happening! Some of the students and parents of Chi Elias who came by to say hi to us today. Hopefully, they will benefit from new classrooms sometime in the near future! These students know English, Spanish, and K'iche' (their native language) by 5th grade. Today, I forgot the word for "May" in Spanish. After we finished our technical assessment, we were able to meet with the students of Chi Elias. They don't return from their holiday break until Monday, but we were so excited that they came by this afternoon anyway. We talked, exchanged vocabulary and songs in our different languages, and played soccer! Apparently Guatemalan children are very good at soccer. They beat us good: 2-0 before thankfully our van came to pick us up and we had to end the game early. Tonight we ate dinner at a "pizza" restaurant, walked around Momostenango a little, and hopefully will go to sleep early to prepare for another early day tomorrow. Today our travel team embarked on our very first trip to Totonicapan, Guatemala! Over the next week I'd like to take you through our journey to assess some new classrooms at Chi Elias elementary school. Our travel team includes our fearless lead Angela, our educational lead Stefan, our leader in all things Guatemala Carlos, our wonderful mentor Brad, and myself. Our journey to Chi Elias started at Rutgers at about 9pm on Tuesday, January 2nd where we met up to head to JFK International Airport. From there, we flew to Panama and hung out at their airport for a few hours while we waited for our flight to Guatemala. Airport food turned out to be more expensive than we anticipated, so Carlos decided to snack on his hoodie instead. Just kidding! We bought sandwiches! They were expensive though! We flew from Panama, landing in Guatemala City around 12:30 Guatemalan time, or 1:30 Rutgers time. Considering we got to JFK around 10:30, this was now 15 hours either in airports or airplanes for us. We were itching to get out and explore Guatemala City! We met up with Brad our mentor, our driver Mario, and some of Carlos' family members! They brought us Pollo Campero, which is like Guatemalan KFC and it was delicious. Guatemala City! I was still trying to figure out how to take pictures out of a moving car window. A brief red light allowed me to regain a steady subject. He drove us in a nice, spacious van 4 hours up into the mountains of Guatemala! We did take a break about halfway through for some delicious chicken and tortillas at a restaurant. As we continued, the roads, though small bumpy at times, took us through some beautiful hilly countrysides. We need to get to sleep early tonight as we are leaving to go to the school at 7:00am tomorrow! I can't wait to see the students and the school tomorrow. I'll keep you updated! The end of the trip at Lake Atitlan. The weekend around Atitlan was beautiful. Travel team enjoyed showers, beautiful weather, and delicious food around the lake, along with some great souvenir shopping. However, on Saturday, the team met with the NGO (non-governmental organization) that initially started the water project in NSCI, Appropriate Technology Collaborative. We met up with Monika Goforth, the ATC Guatemalan director. Monika told us about different projects that ATC currently works on, including finding new, cheaper methods of construction, bicycle powered corn shucking, and plastic shredding to help re-purpose the garbage found all around Guatemala. Monika took the team up a short hike to a school near San Marcos in which solar panels were put in to help power the only school for indigenous children in mostly unelectrified communities around the mountain. The team had a lot of fun, learned a lot, and looks forward to partnering more with ATC in the future through new types of projects along with further support for the water project in NSCI. The team with Monika next to solar panels installed at a local school. On Sunday, the travel team sat down for dinner in Panajachel on Lake Atitlan and discussed their favorite and least favorite aspects of the trip, along with the different tasks moving forward. We are all excited for the project in NSCI to be a success and plan to keep working hard this semester toward that goal. 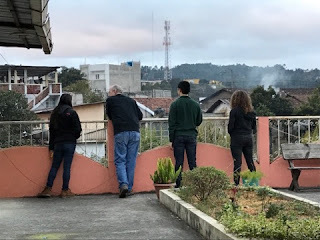 The team said goodbye to Guatemala the following day, and we're now all back in New Jersey with thoughts of all that happened fresh in our minds.